Today is the last day that Dayton Dollars may be spent at the nursery and hopefully everyone will have used up these dollars that garden club members receive. Tomorrow begins our fall sale that will be for garden club members only through Labor Day and then open to everyone else. Anyone not a member is able to sign up the same day to take advantage of the sale by providing their info including his or her e-mail address. More inventory is available this year as I think everyone will be pleased with the selection. Be aware that inventory numbers on our electronic inventory system do not necessarily indicate the total number on sale as some of the stock is in a back stock growing area and will only be available at the regular price. Select items on sale will be marked with clear signage as 50% off and a listing will be on the web site as well as printed copies in the store. Some items not marked are the ones recently stocked although the selection of sale items is broad and wide. Chrysanthemums are not included in the sale as well as a few perennials in the perennial house. For club members for which we have an e-mail address, other specials will be available for Sunday and Monday and will only be sent via e-mail. 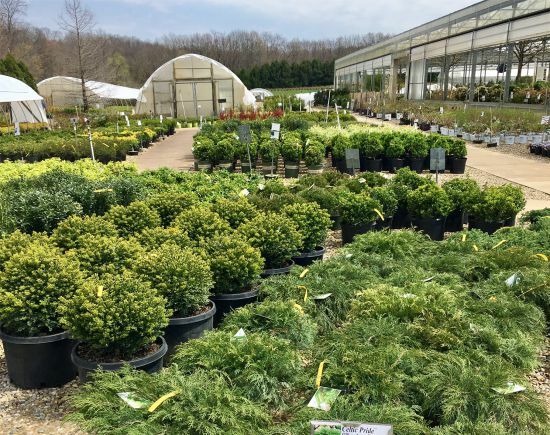 The nursery opens early on Saturday morning at 7:30 and will close and 6 p.m. that day that should give all customers plenty of time to get their choice plants. Arrive early to get the best selection as everything is first come, first serve. For almost everything, planting in fall is an advantage as cooler conditions slow growth while root growth continues. In the hot south of the United States, fall planting is recommended to take advantage of the root growth during the cool season. Fall planting in the north does much the same as root growth will continue until the soil temperature drops below 40º F. Planting many trees and shrubs in fall is almost as if another year of growth has been gained due to the proliferation of new roots that will support the top growth. Have your wish list ready in order to take advantage of our biggest sale of the year. See you at the big sale!